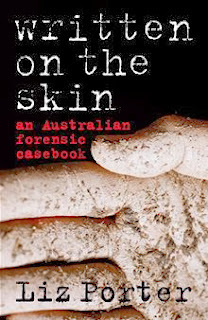 Written on the Skin - an Australian Forensic Casebook was a gift from a family member, and I was lucky enough to receive a copy personally autographed by the author (pictured below). Australian journalist and writer Liz Porter has written a forensic non-fiction book full of Australian crime cases; some of which are well-known (e.g. Bali bombings and the Jaidyn Leskie case) and others readers won't be familiar with. Porter has broken down the cases into subject headings including: Reading the Blood, Reading the Bones, Reading the Crime Scene, Reading the Teeth and so on, for a total of 10 chapters. This was an intuitive way to learn more about forensic science and how specialists in each field (entomologists, odontologists, DNA specialists, pathologists, chemists, document examiners and handwriting experts) conduct their work. Porter selected cases from different time periods in Australia to enable a better understanding of how forensic science has changed and improved over the years. I didn't realise until now just how vital the state of Victoria was in solving Australian crime. "Victoria is home to two nationally pre-eminent forensic establishments: the Victorian Institute of Forensic Medicine (VIFM) and the Victoria Police Forensic Services Centre (VPFSC)." Pages xiii and xiv. "Both the VIFM and VPFSC are leading teaching institutions... and the VIFM is widely considered to be the leading institute of its kind in Australasia and, with its state-of-the-art facilities, among the best in the world." Pages xiii and xiv. There are some confronting topics and real-life crimes described in Written on the Skin, so the reader will need to have the mental fortitude to get through some of this material. (I broke up the content by reading another book alongside this one). I highly recommend Written on the Skin to fans of true crime and those with an interest in the sciences. Viewers who enjoy TV shows like CSI will learn how crime scenes are really investigated and processed. Younger readers deciding on a future in forensic science may also find Written on the Skin an informative and educational read. Sounds like something I'd enjoy! Thanks for sharing, Have a happy week! Thanks Shelleyrae, and hope you have a Happy New Year! I'm currently putting together some questions to interview Liz Porter so stay tuned for more!